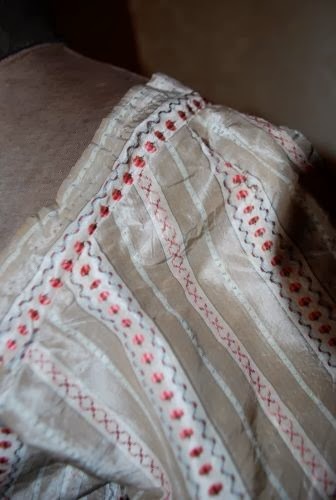 THE FRONT WOULD HAVE BEEN COVERED WITH A STOMACHER , FRONT WOULD HAVE PINNED CLOSED, SMALL PIN PRICKS ARE SEEN TO THE LINEN. 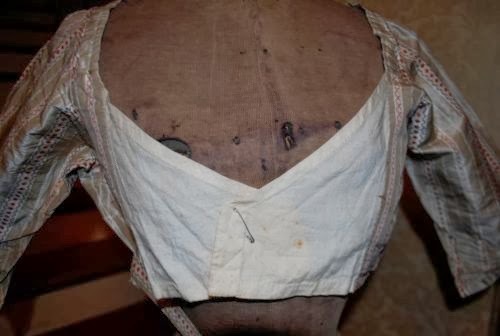 MEASURES 34 INCHES AROUND THE BUST, ROUGHLY 28 INCHES AROUND THE WAIST, AND 12 INCHES IN LENGTH. Most likely late 1790's. 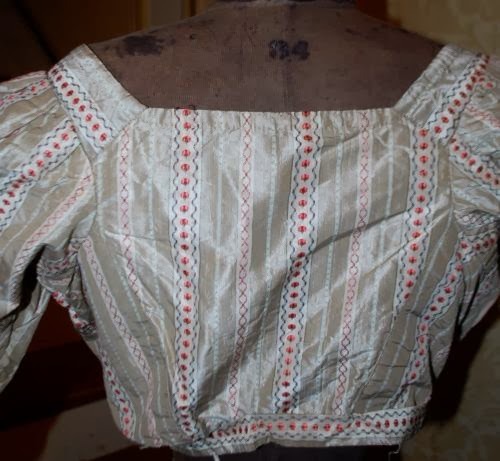 A fichu would have been worn over the front closure. 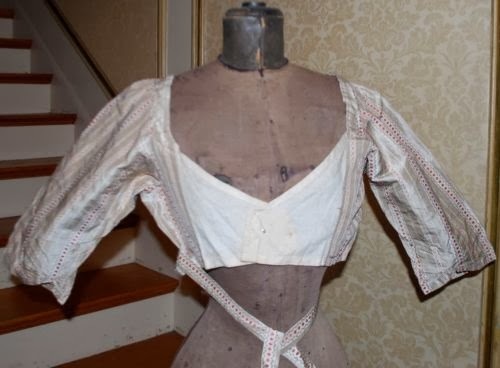 This looks more like the bodice to an apron front or drop front gown that is missing the bib and the skirt rather than any sort of spencer jacket. What a shame this piece was cut apart and is missing the skirt, I hate to see when that happens. I am so glad you said this as when I saw the photos, I thought the same thing. That it was a standard drop front silk dress with the drop and skirts removed. but without a front. 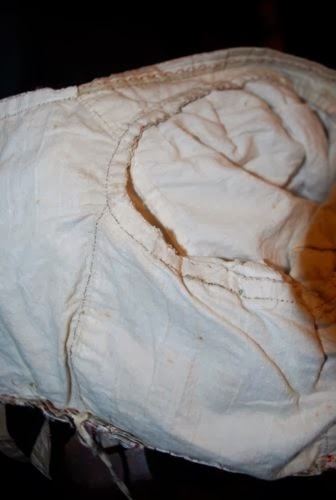 You can see the belt closes in a similar fashion to this extant spencer. 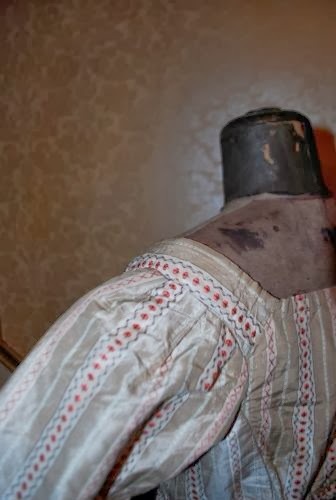 I suppose the best thing about historical fashion is that we are all entitled to our own interpretations of things, as without a time machine, we will never know for sure :). Very interesting discussion :) I really enjoyed the links you provided, Isabella. These fashions are just a dream. 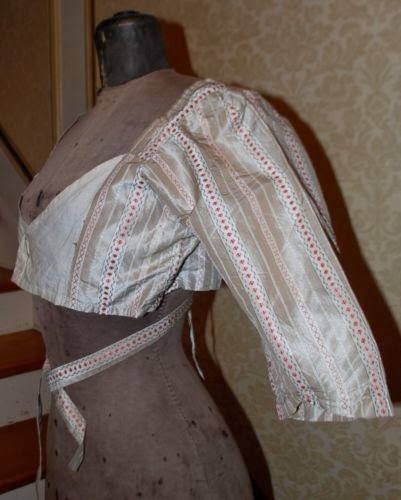 How interesting that no extra expensive fabric (the silk) was spared when the front was intended to be covered.